Need inspiration and a few laughs? Join us for great conversations, great photos, great inspiration, and maybe even a few great giveaways! It’s the place where every mother, sister, photographer, artist, blogger, reader, man and woman should be! 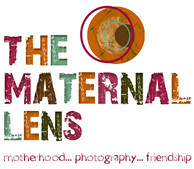 This entry was posted in blogs, The Maternal Lens. Bookmark the permalink. delightful!!!!!!! can’t wait to see more!